An embedded video on the Mr Methane website. 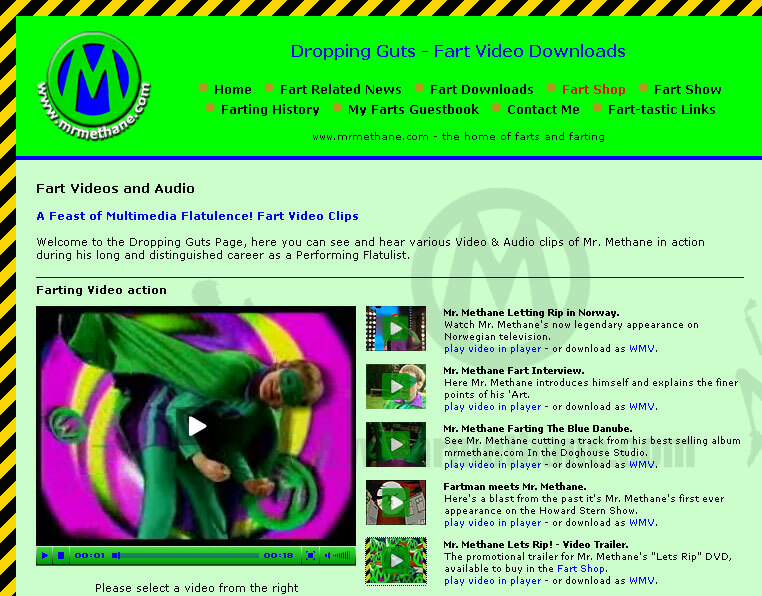 I have this evening implemented a Flash based video player solution to the Mr Methane website. Last week a re-skin was applied to the website, breathing new life into the highly popular entertainer's site. Previously on the website, a series of video clips were available to download in Windows Media (WMV) format, and prior to that in Real Video format. As part of an ongoing catalogue of improvements, I decided that an on-page video player, similar in style to the Youtube player we know and love, was the way forward. I chose a Adobe Flash based solution, which plays files in the FLV (Flash Video) format. Playing FLV files makes sure the player is both cross-platform and cross-browser compatible, provided Adobe Flash player is installed of course. It was easy to integrate with the back-end site, which runs server-side in ASP. To prevent any site slowdown issues due to video bandwidth, I chose to host the movie clip files on a sub-domain of the main site, which runs from a separate web server. This can easily be done, although you may have to pay extra to host a sub-domain on your website, depending on your Web Hosting provision. Please contact me for more information on on-page video playing, website hosting, or sub-domains.